The ‘golden’ land lot at 164 Dong Khoi Street, originally uploaded by Kiva.Dang. HCMC’s Department of Planning and Investment is preparing to invite tenders for two projects to develop two lots of lands in prime locations in the city, said a department official. The official, who is also a member of the city’s bidding committee, said one of the lots was at 164 Dong Khoi Street in District 1 and the other also in the downtown area. 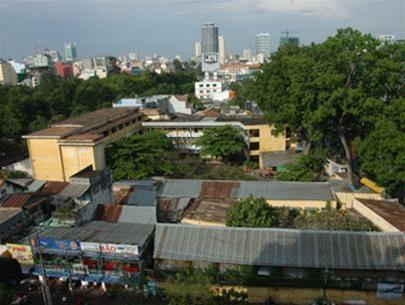 The Dong Khoi Street lot could be the first to be put up for tender because it has attracted the attention of many potential investors and it is easier to be cleared than the other lots, the official said. This 9,700-square-meter ‘golden’ lot is bordered by Nguyen Du, Dong Khoi and Ly Tu Trong streets, with 7,100 square meters managed by the city’s Department of Culture, Sports and Tourism and the remainder owned by around 145 families. According to the city government, 66 investors are asking to bid for this land including Indochina Capital, HongKong Land, and VinaCapital. This land lies within a community of architectural landmarks such as Notre Dame Cathedral and HCMC Post Office. The HCMC Department of Zoning and Architecture has already set basic architectural standards for this project regarding maximum heights for structures of the project facing different streets. The location of the second lot has not been revealed, but, as observed by the Daily, it is surrounded by Le Loi, Nam Ky Khoi Nghia and Huynh Thuc Khang streets and totals 4,470 square meters. This lot has attracted three investors. The controversial “golden land plot” in downtown HCMC will be offered to bidders again in a new competition after the Prime Minister in his instruction to the city demanded that the local government find agreeable solutions to prolonged complaints by a losing bidder. HCMC vice chairman Nguyen Thanh Tai on Monday asked the Department of Planning and Investment and other related agencies to seriously learn from their mistakes to ensure that the new bidding round for the land plot of 13,000 square meters would be properly handled. There is no mention of the cancellation, but an expert of the city’s Department of Planning and Investment said the bidding results last year would be effectively cancelled. The triangular area surrounded by Tran Hung Dao, Nguyen Thai Hoc and Pham Ngu Lao streets in District 1 was the cause of heated debate and a war of word last year when Khanh Gia Consortium as the runner-up in the bidding round challenged authorities on the legitimacy of the winner, Thai Son Consortium. In his instruction issued on Monday, Tai demanded the Department of Planning and Investment, the city-run bidding committee, and related departments suggest solutions for reorganizing the bidding as well as solving the complaints related to this project. “The solutions must conform to prevailing bidding regulations,… and avoid the lengthy complaints,” vice chairman Tai said in his document. Talking with the Daily on Monday, a member of the bidding committee said that the cancellation was obvious since Thai Son Consortium as the winner in April this year decided to withdraw from the project. “Under the bidding regulations for this project, the bidding result that was approved in April last year by the city’s government will be cancelled, and the city will publicly reorganize the tender for selecting a new investor for this project,” said the source who asked not to be named. Thai Son Consortium had been approved as the winner of the bidding in April 2008 to develop high-rise buildings on the prime site with total investment capital of some VND4.9 trillion after the consortium had pledged to support the city with some VND1.9 trillion. Thai Son Consortium grouped eight investors including Thai Son Investment and Construction JS Company, Chi Thanh Investment JS Company, Anh Duong Financial Investment JS Company, Bank for Investment and Development of Vietnam (BIDV), and BIDV Land Company. There was also the involvement of Hanwha Construction JS Company, Hanshin Construction Company Ltd. and Hanwha Galleria Company Ltd. in the consortium. After the bidding results were announced, Khanh Gia Consortium loudly voiced its opposition, challenging the city authorities for what they called irregularities during the bidding process. Khanh Gia was defeated in the final round although it offered a higher price of some VND6.7 trillion of investment, but a smaller financial support of only some VND360 billion to the city budget. According to the conclusion of the Government’s Inspectors, irregularities were found in the bidding organization, including lack of up-front approval from the Central Government. HCMC vice chairman Nguyen Thanh Tai, therefore, in his instruction on Monday asked relevant departments to review mistakes in the bidding process, although he said certain mistakes were unavoidable for a trial bidding like this. The Department of Planning and Investment said the city this year would invite bids to select potential investors for six other projects before inviting tenders for the triangular 13,000-square-meter “golden land” project as the city government needed to consult the People’s Council on the cancellation. According to the bidding committee, the city will not apply the old bidding regulations that applied in the previous bidding. The new bidding regulations will base mostly on Circular 03/2009 issued on April 16, 2009 by the Ministry of Planning and Investment. Ho Chi Minh City’s property bidding environment is likely to improve on the back of its controversial golden sites pilot programme. The city’s Department of Planning and Investment (DPI) last week proposed a draft bidding evaluation criteria, which set a 100-mark assessment of bidder’s investment ideas such as objectives, scale, construction timeline, and socio-economic effectiveness (20 marks), real estate project investment and management experience (30 marks) and financial capacity (50 marks). Bidders, who have more than 70 marks, will make a short list which will be dedicated by total investment values. Pham Van Hai, general director of Asia Commercial Bank Real Estate Company (ACBR), said the evaluation process would continue to be hurt if the city still considered bidder’s financial support to the city a decisive factor in deciding bidding winners. Ho Chi Minh City previously introduced two pilot bidding sites, Binh Thanh district’s Van Thanh market and District 1’s Tran Hung Dao, Nguyen Thai Hoc and Pham Ngu Lao street triangle. 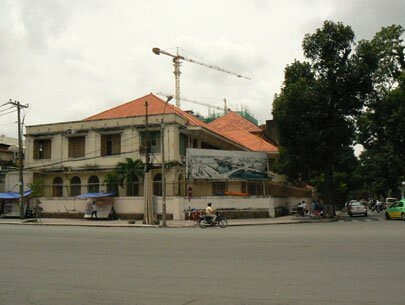 The bid for the 13,000-square-metre triangle site, however, is still under government investigations as Khanh Gia consortium as the bidding loser, which offered $415 million to develop the property complex and agreed to donate $21.2 million as goodwill support for the city’s budget, complained to the government over alleged bidding irregularities. The winner Thai Son Consortium pledged $406 million in investment, but offered a higher financial support of $111 million in the final competition round early last year. DPI director and head of the city’s bidding steering board Thai Van Re told a people’s committee meeting last week the pilot bidding sites had provided a lot of experience and some incidents would be prevented from recurring. “The mark-oriented bidding assessment will help us avoid subjective bidding judgments as their every attribute will be counted in the assessment process,” Re added. The draft, which is waiting for the people’s committee’s approval, requires bidding sites to be publicly announced via the media and the Ministry of Planning and Investment’s website at least two months before bidding documentation is issued. Also, if the winner fails to kick-start a project in a regulated time, they will risk losing the project and be prohibited from taking part in any bidding for three years. The people’s committee, meanwhile, has fundamentally approved investment guidelines for two District 1 golden sites surrounded by Nguyen Hue, Ngo Duc Ke, Ho Tung Mau, and Huynh Thuc Khang streets and Ho Tung Mau, Huynh Thuc Khang, Ton That Dam, and Ton That Thiep streets. The sites’ planning will be soon announced and brought online for public bidding under DPI guidance.